One of the sometimes forgotten aspects of bike fitting is the option of going with a different saddle. Today I received my demo shipment of ISM seats. These are often mislabeled as strictly TRI bike saddles. Fact is they can be used on any bike and often the one that feels best is not the one you might have thought when we started your bike fitting. I like the option of trying multiple saddles and try to offer a variety. ISM offers everything from firm and short to soft and long as well as some cruiser models. The demo collection I have consists of 5 models. The PN series 1.0, 1.1 and 2.1 are the “performance narrow” and are increasingly soft as the numbers increase. The PL series 1.0 is in the “performance long” category. The PS series 2.0 is the “replacement” for the Adamo road saddle that has been around for years. 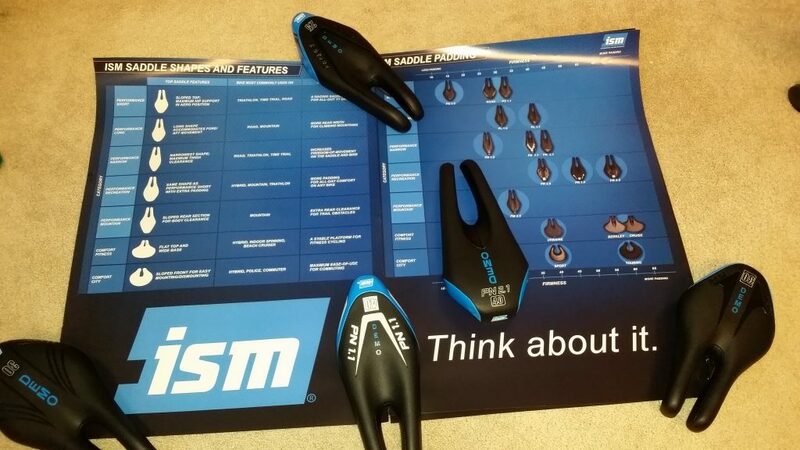 These are a good representation of what ISM offers and among the other saddles from Shimano, Fizik, SMP and Infinity among others you are sure to find one that will work for you. Feel free to call or email me for a bike fitting or even just a saddle demo if that is what you are interested in.